In a sign that John McCain's convention bounce has dissipated, Barack Obama has taken a 48 percent to 43 percent lead over his Republican rival among registered voters in the latest CBS News/New York Times poll. McCain had a two percentage point lead among registered voters in a poll released on September 8th, just after the Republican National Convention. Prior to the party conventions, Obama led McCain by 3 points. In the new poll, the gap among likely voters is the same as it is among registered voters: Obama leads among those seen as likely to go to the polls in November 49 percent to 44 percent. This race remains up for grabs. One-fourth of the electorate is now uncommitted, meaning they say they could still change their minds about their candidate or remain undecided entirely. Roughly twenty percent of both McCain and Obama supporters say they have not yet settled definitively on their chosen candidate. Though McCain's supporters have become more enthusiastic about the Republican nominee, he still suffers from an enthusiasm gap. Sixty-one percent of Obama supporters are enthusiastic about their candidate, up eight points from last week's poll; forty-seven percent say the same of McCain, up five points from last week. Obama's advantage can be traced in part to independents, who favored Obama in late August, swung to McCain just after the Republican convention, and have now returned to Obama. Obama now leads McCain among independents 46 percent to 41 percent. Obama leads McCain 54 percent to 38 percent among all women. He holds a two point edge among white women, a 21 percentage point swing in Obama's direction from one week ago. While Palin remains popular among McCain voters, the poll suggests that the McCain campaign may have cause for concern. More than half of registered voters do not think Palin is prepared for the job of Vice President, and even McCain supporters cite "inexperience" as what they like least about her. Contrast that with the perception of Obama's selection of Delaware Sen. Joe Biden as running mate: 57 percent of registered voters say Obama chose Biden because he is well qualified. Thirty-one percent say the choice was to help with the election. Nonetheless, McCain supporters are far more enthusiastic about Palin than Obama supporters are about Biden. Sixty-nine percent of McCain voters - including 78 percent of white evangelical McCain backers - describe themselves as "enthusiastic" about Palin. Just 27 percent of Obama supporters are "enthusiastic" about Biden, though an additional 58 percent say they are "satisfied" with the Democratic vice presidential nominee. Palin's favorable rating stands at 40 percent, down 4 points from last week. Her unfavorable rating, which stands at 30 percent, has risen eight points in the same time period. Her favorable rating among women has fallen 11 points in the past week. Biden is viewed favorably by 38 percent of registered voters. Seventeen percent view the Delaware senator unfavorably, a decrease of 5 points from last week. Nearly 3 in 4 voters say Biden is prepared to be vice president; just 42 percent say Palin is prepared for the job, down 5 points from last week. But Palin is seen as the more relatable of the two: 55 percent of registered voters say she is someone they can relate to, while 43 percent say the same of Biden. Asked what they like most about Biden, registered voters cited experience (15 percent), followed by "honesty" (6 percent), "outspoken" and "foreign policy" (5 points each). Asked the same question about Palin, the top two choices were "outspoken" and "woman" (7 percent each), followed by "fresh face" and "tough/fighter" (5 points each). Asked what they liked least about the candidates, the top response for Biden, at 8 percent, was "too many gaffes." The top response for Palin, at 15 percent, was inexperience. Voters who supported Hillary Clinton in the primaries are not fully embracing the new woman in the race. Forty-eight percent of Clinton voters say they have an unfavorable view of Palin, while 20 percent view her positively. Still, one in four registered voters who were Clinton supporters in the primary say they plan to support the McCain-Palin ticket in November. While both Obama and McCain are now vying for the mantle of change agent in this election, Obama is seen by a far higher percentage of voters as likely to bring real change to Washington if elected President. 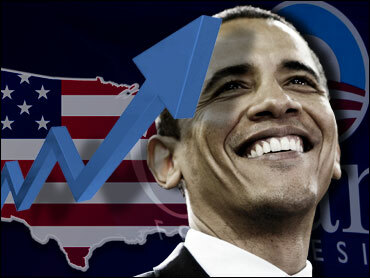 Sixty-five percent of registered voters say Obama would bring real change, while just 37 percent say the same of McCain. Nearly 60 percent of voters say McCain would not bring change. The differing views of the two candidates are driven largely by the differing views held by independent voters. (Democrats and Republicans overwhelmingly believe their party's candidate will bring change.) Sixty-one percent of independents say Obama would bring real change; 35 percent say the same of McCain. Forty-seven percent of registered voters say Obama is a different type of Democrat; roughly the same percentage say he is typical. McCain, a self-proclaimed maverick, is seen as a different type of Republican by a smaller percentage, 40 percent. Fifty-seven percent of registered voters cast McCain as a typical Republican. The two candidates retain the strengths and weaknesses each has held for some time: McCain is viewed as better prepared and a more effective commander in chief, while more voters relate to Obama and feel he understands them. Each candidate's age seems to work for him rather than against him. Fifty-eight percent of registered voters say Obama's relative youth helps him have fresh ideas; 24 percent say it makes him too inexperienced. Fifty-four percent say McCain's age makes him experienced, while 31 percent say it makes the job too difficult. CBS News detailed the Americans' pessimism about the economy in a poll released hours ago; as was noted, only 22 percent of Americans say the condition of the national economy is even somewhat good, and six in 10 think the economy is getting worse, not better. President George W. Bush's job approval rating remains low, with just 27 percent of Americans approving of the job Mr. Bush has done as president. As detailed in the earlier poll, voters are slightly more confident in Obama's ability to handle the economy than they are in McCain's. But they are also more likely to think their taxes will go up in an Obama administration. Nearly half say Obama will raise their taxes, while roughly one in three say the same of McCain. Forty-two percent of Americans believe the 2001 Bush tax cuts should be made permanent, down five points from last month. Thirty-six percent now believe the cuts should be allowed to expire. Fifty percent of Americans say the troop surge is working, up 20 points from a year ago. Still, most Americans continue to think the U.S. should have stayed out of Iraq in the first place, and 53 percent now say the war in Iraq is not a part of the war on terrorism - more than ever before. Nearly six in 10 Americans think the next president should try to end the war in Iraq within the next year or two, while about 4 in 10 think he should continue fighting in Iraq as long as he feels it is necessary. Fifty-two percent of voters are at least somewhat confident that Obama can handle the situation in Iraq, while fifty-six percent are at least somewhat confident McCain can handle the situation. Voters are more likely to be very confident in McCain's ability: 36 percent say they are very confident that the Republican nominee can handle the situation, while 26 percent say the same of Obama. This poll was conducted among a random sample of 1133 adults nationwide, including 1004 registered voters, interviewed by telephone September 12-16, 2008. Phone numbers were dialed from RDD samples of both standard land-lines and cell phones. The error due to sampling for results based on the entire sample and registered voters could be plus or minus three percentage points. The error for subgroups is higher.